Professional Premium Master Airbrush Cake Decorating System with 3 Multi-Purpose Master Airbrushes. Airbrush Models: G22 Gravity Feed, S68 Siphon Feed, E91 Siphon Feed and the TC-60 Professional Compact Compressor. Plus 12 Popular US Cake Supply Airbrush Food Colors. Has everything you will need to get started! Perfect for Bakeries or for Private Use. Includes Master's How-To-Airbrush Manual. Versatile system is ideal for multiple uses. Hobbies, crafts, fine art, nail art, temporary tattoos, cake decorating, sunless tanning, cosmetics, auto-motorcycle graphics & more! Master Airbrush Model G22 Airbrush Set. Master Performance Multi-purpose high performance dual-action airbrush with a 1/3 oz. Gravity fluid cup and a 0.3mm needle & nozzle that allows you to spray from hairline up to 1-1/2 wide patterns. Master Airbrush Model S68 Airbrush Set. Master Performance Multi-Purpose Precision Dual-Action Siphon Feed Airbrush with a 0.35 mm Needle/Nozzle, 3/4 oz. Fluid Bottle and a 1/6 oz. Color Cup that allows you to spray from fineline up to 2 wide patterns. Master Airbrush Model E91 Airbrush Set. Single-action external mix siphon feed airbrush set with a 0.8mm tip, 2 - 3/4 oz. Siphon bottles and has an 1/8 air inlet (airbrush can be used with a compressor or with the included hose & adaptor for a propellant can). Master Airbrush Air Compressor Model TC-60. Professional super quiet high performance compact airbrush compressor with small air tank that includes a built-in airbrush holder, air pressure adjustment regulator and gauge, plus 6' braided hose with mini-inline moisture filter. Cake Supply Air-Mist Airbrush Food Coloring Set. 12 of the most popular airbrush colors in 0.5 fl. Bottles: white, black, red, yellow, royal blue, green, purple, pink, orange, brown, flesh and sky blue. 2 - 6 Foot Braided Air Hose with 1/8 Fittings. How-To-Airbrush Manual & Guide Booklet. Master Performance Multi-Purpose Precision Dual-Action Gravity Feed Airbrush with a 1/3 oz. Gravity Fluid Cup and a 0.3 mm Needle/Nozzle. Fine art, nail art, temporary tattoos, cake decorating, hobbies, crafts, auto and motorcycle graphics & more! Ideal for beginner to advanced artists and most usage applications or paint spray media. Gravity feed with dual-action (air & fluid control) trigger; Internal mix for a fully atomized spray pattern. 0.3 mm Needle and nozzle. (9 cc) Gravity feed fluid cup. Hairline to 1.5 wide. Instruction guide, nozzle wrench, 2 cc eye dropper and molded plastic storage case. Inks, Dyes & Food Coloring. Made with high quality precision components that enable this airbrush to work efficiently while providing exceptional atomization and accurate spray control. Multi-purpose usage, as it works well with most paint media and applications. The comfortable balanced feel enables use in production spray environments. The solvent resistant PTFE needle packing prolongs the airbrushes life. It enables you to use of solvent based automotive paints: urethanes, lacquers and enamels. Removing the needle & nozzle caps enable you to spray the full range of texture & stippling effects. Airbrush rebuild kits and replacement needle/nozzle sets are available. Siphon feed with dual-action (air & fluid control) trigger; Internal mix for a fully atomized spray pattern. 0.35 mm Needle and nozzle. Instruction guide, nozzle wrench and molded plastic storage case. Ideal for applications that require quick color changes with large or small amounts of fluid for detail to background spraying. Master Single-Action External Mix Siphon Feed Airbrush Set with 0.8mm Tip and 1/8 air inlet. (airbrush can be used with a compressor or with the included hose & adaptor for a propellant can). 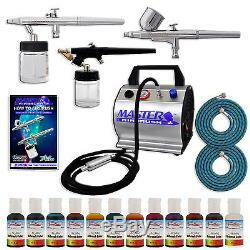 Great starter airbrush kit for beginners, students and hobbyist! Versatile airbrush, use with paint for sunless tanning, temporary tattoos & cake decorating. 0.8 mm Tip with a broad spray pattern from 1/4" to 1-1/2" wide. 2 - 3/4 oz Siphon feed fluid bottles. Propellant regulator w/ 5 ft connection hose. Siphon feed with single-action air control trigger; External mix for a fully atomized spray pattern. (No adaptor is required, but 5mm to 1/4 adaptor is included). Instruction guide, 2 cc eye dropper and molded plastic storage case. Professional Super Quiet High Performance Compact Airbrush Compressor with Small Air Tank. Includes a built-in Airbrush Holder, Air Pressure Adjustment Regulator and Gauge, plus 6' Braided Hose with Mini-Inline Moisture Filter. Delivers air with constant pressure & zero pulsation! An ideal compact work station compressor! 1/6 Horsepower; Delivers high air volume (0.6 cfm) and air flow (23 ltrs/min). Lightweight, compact and easy to carry with the built in handle. Air pressure adjustment regulator knob with pressure gauge. Preset for automatic turn off when air pressure reaches 45 psi. Preset for automatic turn on at 30 psi. This enables a longer compressor life from less motor wear and heat-related moisture. Constant Pressure and Zero Pulsation. Air is drawn from the small air storage tank providing you a constant regulated pressure. There's zero pulsation because air is drawn from the tank which eliminates any pulsation effect from the pistons. Automatically turns itself off if the unit becomes over heated. Easy to operate with a built-in airbrush holder. Maintenance free, oil-less and quiet operation (47 db). So you can be assured of quality and reliability. Airbrush types, applications, paint and color media and levels of users from beginner to advanced artists. Suitable for hobbies, crafts, nail art, auto graphics temporary tattoos, tanning, cake decorating, etc.. Model TC-60 Air Compressor Specifications. Single cylinder piston with 0.08 gallon (0.3 liters) air tank. Pressure adjustment regulator and gauge. Factory preset at 45 psi, without preset control 100 psi. 6.5" h x 6" w x 7 l. Cake Supply Air-Mist Airbrush Food Coloring Set - 12 of the Most Popular Colors in 0.5 fl. Air-Mist Airbrush Colors by U. Cake Supply are the ideal, edible spray-on food coloring for use with any level of cake decorator. With Air-Mist, cake decorating has never been easier. White, black, red, yellow, royal blue, green, purple, pink, orange, brown, flesh and sky blue. Air-Mist Airbrush Colors Features & Benefits. Air-Mist Airbrush Colors are highly concentrated edible airbrush food colors with superior strength and are the brightest and truest colors available. Colors are so highly concentrated, that a little goes a long way. Colors come in easy-to-use flip-top dispenser bottles. Achieve an endless spectrum of magnificent colors with these intermixable airbrush colors. Perfect for use on cakes, gum paste, fondant, pastries, sugar paste, icing, isomalt, and more. Apply colors with an airbrush or paint them on with a brush. All the Air-Mist colors are made in the USA with high quality FDA approved ingredients, and are Certified Kosher. We are an authorized dealer for all the product lines we sell. If a listing is for a particular item then that is what you will receive. If you do want to attempt to change an order or make an address change, it is best to call our customer service department immediately. Once you pay your order prints in our warehouse for fulfillment. If you have questions on how to do this, please message us first. INTERNATIONAL ORDERING: All of our electronic items are rated for US voltage 110V. It is the customer's responsibility for knowing the correct voltage requirement of their country. If you select this option at checkout, be advised that if package is lost, stolen, or damaged, no claims can be filed. The item "Pro CAKE DECORATING SYSTEM 3 Airbrush Kit 12 Color Food Coloring Set Compressor" is in sale since Monday, November 14, 2011. This item is in the category "Home & Garden\Kitchen, Dining & Bar\Cake, Candy & Pastry Tools\Cake Decorating Supplies". The seller is "tcpglobal" and is located in San Diego, California.